The Fresno State Media Guide is designed to give journalists, researchers, the University community and others information they need to learn more about Fresno State or to arrange an interview with a faculty member or administrator. As a public institution, the University is generally an open and public place that provides news media reasonable access. However, the University may regulate media access so as not to disrupt teaching or research; to protect the health and safety of students and staff; to protect the privacy of students and others who live on campus; and to comply with state and federal laws on student and personnel data. 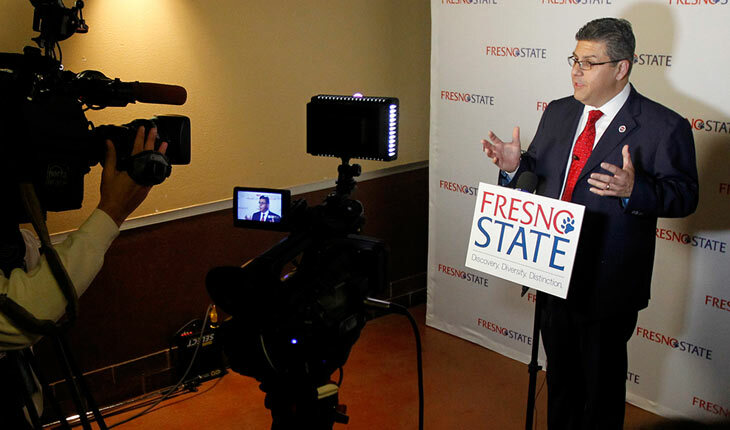 The guidelines described in the link below pertain to media access to Fresno State-owned or -controlled property and to any individual or group conducting interviews, making audio or video recordings or photographic images for dissemination to the public via commercial or noncommercial news and information outlets, including the Internet. Browse the Fresno State News archives from 1998-present. Information about the California State University and its 23 campuses.